Policy-makers are often tasked with making difﬁcult decisions in the face of an uncertain future outlook. Will infrastructural investments still be relevant in 25 years? What new markets are likely to emerge in the medium term? How will a gradual increase in average temperatures over the coming decades affect livelihood security Though largely context speciﬁc, these are but three examples of the types of forward-looking questions that should be asked of many longer-term policies or plans. Despite this need, the development and humanitarian sectors continue to face criticisms over their relative rigidity and short-termism with regards to project funding and delivery. Recent emphasis on promoting a ‘resilience approach’ to programming has resulted in calls for more longer-term objectives and deliverables, greater ﬂexibility in planning processes, as well as better collaboration and coordination amongst key development actors. Though easy to describe in abstract terms, knowing how to put these principles into practice is a considerable change. More importantly, few tools are available to help translate the conceptual arguments into tangible changes and recommendations for day-to-day programme activities. Those that do exist have so far failed to inspire the scale of change and interest needed to instigate appropriate change. This is where this paper hopes to add some value. Drawing on insights from complexity science, it describes what processes are needed to promote Flexible and Forward-looking Decision Making (FFDM). FFDM starts from the position that to know exactly what the future will bring is not only complex, it’s largely impossible. While gathering (and using) information about likely future trends and changes will be crucial, it also recognises that planning and policy deliverables will have to be ﬂexible to deal with uncertain (or unforeseen) events and/or changing pressures. Similar to most policy frameworks, complexity inspired FFDM is often difﬁcult to grasp in practical terms – given its grounding in various abstract theories and concepts (something all too common in the ﬁeld of adaptation and complexity science). With this in mind, the paper puts forward the use of ‘serious games’ as a practical means of not only, a) understanding some of the more abstract principles of FFDM, but b) offering an innovative means of communicating and inspiring the need for real policy change. More specifically, the paper proposes a coupled game and reflection-based approach. This looks at the ability to capitalise serious games to encourage experimental learning as well as ensuring enough time is provided to reflect on how key components of the game relate to the 'real-world'. It also allows participants to identify their own routes forward for improving decision making processes. This paper lays the ground work for the next phase of research under the Africa Climate Change Resilience Alliance (ACCRA). ACCRA will be researching the principles outlines within as well as trailing three separate couples game-and reflection events across its core countries, namely Ethiopia, Uganda and Mozambique. Although not all the nuances of complexity theory, climate change adaptation or 'serious game' can be explored in the remit of a single paper. It hopes to provide an introduction to many of the key concepts. More importantly it aims to highlight the synergies between the three disciplines and lay the foundations for further elaboration and insight. all this is when maintaining the overarching goal of empowering actors in enhancing their capacities and level of agencies to deal with climate change and uncertainties. The full text is available to download from the right-hand colum. The current state of play: How are development and humanitarian interventions working with change and uncertainty? Jones, L., Ludi, E., Beautement, P., Broenner, C. and Bachofen, C. (2013). 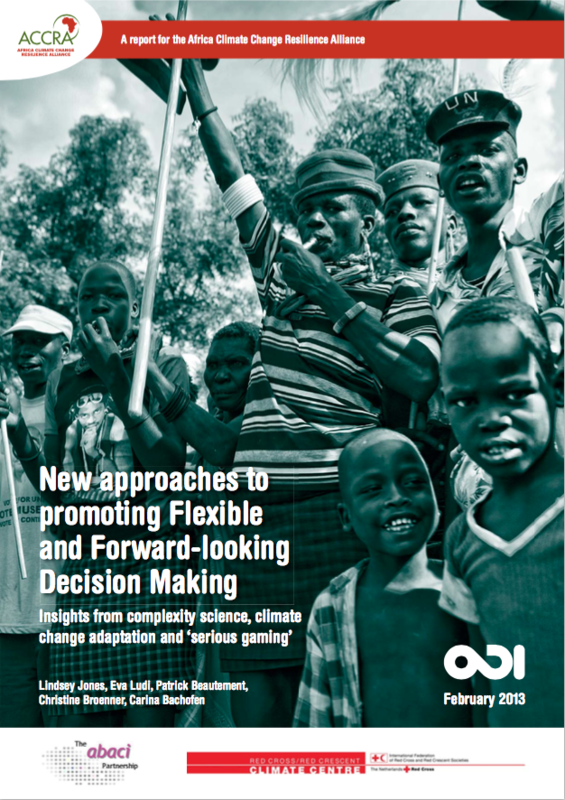 New approaches to promoting flexible and forward-looking decision making insights from complexity science, climate change adaptation and ‘serious gaming’. pg. 23. Overseas Development Institute, London.